This online video course covers what a typical automation engineer would need to know to get started using Selenium with Java. The course covers in detail all the key concepts he or she would need to know to be successful with Selenium Java test automation. The course covers the Selenium WebDriver API and all its functionality in detail. There are over nineteen hours of video material. 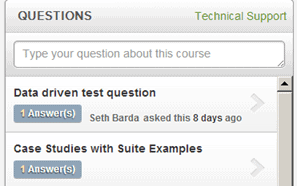 I like that I can go in to Udemy at any time and review any of the video lectures I’ve already completed. I’ve already revisited many of the modules to refresh my memory on some of the concepts. There is a hands-on exercise after each of the in-depth videos. Each section ends with a follow-up video on the solution for sections hand-on exercises. I think this is an excellent course for engineers who need to get up to speed with using Java & JUnit with Selenium. The course is easy to follow, and the topics are presented with examples similar to those that most engineers will face when they start doing Selenium automation development. The instructor is a seasoned Selenium consultant with real-world experience and shares tips and best practices he has learned along the way. This is not a course for someone who is looking for non-hands- on academic overviews of Selenium. This has helped me when training other people because it provides a high level way of chunking the Selenium information that will provide a reminder of what you need to do when you start developing tests for an application. Currently, the course is $299, which is a steal as far as I’m concerned, since I remember (my company) having to pay $2,500 for HP training that was nowhere as good as this. With Udemy you’ll get lifetime access to the course, so if you forget something you can easily go back and review the area(s) you need a refresher on. Also—I should point out that I am not being reimbursed for this endorsement. This is not an affiliate link! This is simply my unbiased opinion on a great course that I think some of my readers would benefit greatly from. In addition to this course, Alan has also written a fantastic book on Java for Testers, which I reviewed a while back. It’s something you should check out if you feel you’re not ready to commit to a full-blown training course.